For some time now, we have been anxiously waiting to show you the location of Papa’s Sushiria. It was first hinted at 4 years ago in Papa’s Hot Doggeria, when the Sakura Bay Samurais played ball at Griller Stadium. This game has been in the back of our minds for so long that it’s just really awesome to see it finally come to life. 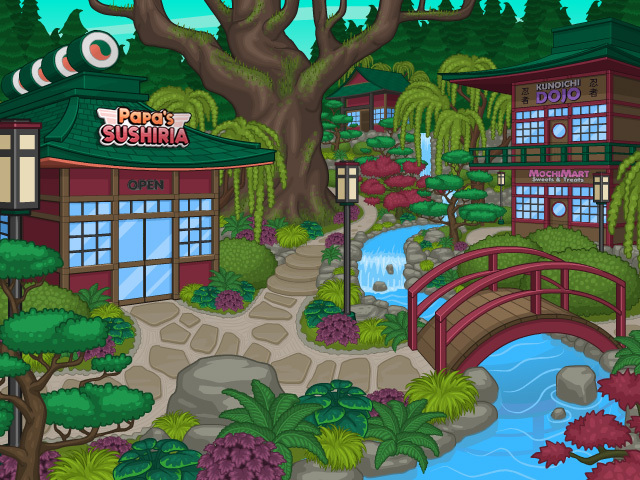 Papa’s Sushiria is located in the serene town of Sakura Bay. This small town strives to keep a perfect balance between buildings and nature. The citizens of Sakura Bay take great pride in their garden-like town, and each person does their part to maintain the beautiful plant-life that surrounds them. You could say, Sakura Bay is the polar opposite of our last location, Whiskview Mall. Flipline really outdid themselves with the artwork this time! *Cries* It's beautiful!! It's everything I imagined. PERFECT! I couldn't imagine the restaurant being anywhere else. And SB is such a peaceful little town. Perfect. I expected something like this btw.